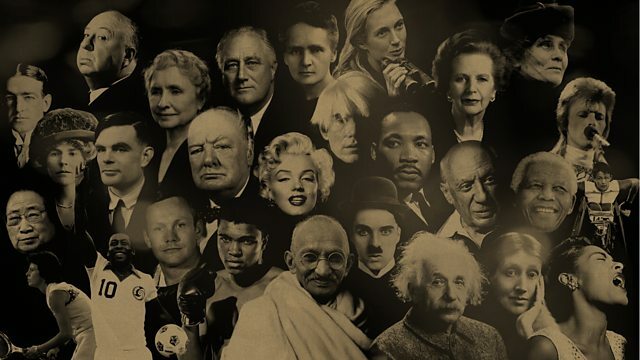 The live final of the series exploring the achievements of some of the greatest figures of the 20th century. The public vote for who they believe should be called the greatest. In this live final hosted by Claudia Winkleman and Nick Robinson, the celebrity advocates return to fight their winning icon's case, and the public vote for the person they think was the greatest figure of the 20th century. Further information and debate can be found across the BBC to help viewers decide which of the seven finalists to vote for. During his illustrious broadcasting career, Sir Trevor McDonald has interviewed many of the top politicians of our time. He argues that 'the ultimate icon should be a political leader due to the commitment of their desire to be of service to their community, to their society, or to their nation'. Dermot O'Leary believes that it is exploration that has had the most profound effect on the world around us and our place in it: 'Explorers have taken us on a journey from conquest to understanding. The work of explorers has changed how we see our world and ourselves'. Kathleen Turner wants an entertainer to win the public's vote: 'They may not be leaders - but they still led the way.' She argues that it is the audience that turn entertainers into stars, which makes them 'icons in the truest sense - because they already belong to us'. Sanjeev Bhaskar is fighting for an activist to be the icon of the 20th century because 'they were trailblazers who gave dignity to the debased and helped move power from the few to the many'. These were people, he says, 'that at great personal cost inspired thousands, millions to do the same as them'. Who will the greatest icon be? Voting opens near the start of the programme and there will be two ways to cast your vote: by telephone (details are outlined during the final) or via the series website. The winner is announced at the end of the final.